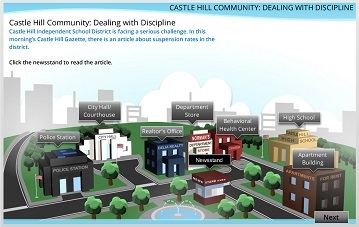 Because the school discipline challenges you face are so complex, they require all the tools at your disposal. A systemic, multipronged approach—with key strategies integrated throughout your plan—has the highest likelihood of success. Our course will help you explore the five key strategies—policies, classroom management and engagement, evidence-based programs and practices, school and community support services, and family engagement—that will be essential to your comprehensive Positive School Discipline program. Another key component to your plan is the use of data in decision-making. Collecting school and district data through a needs assessment will help you and your partners identify the scope of existing problems, determine your actions, and monitor your progress. In addition, you will learn what is already working and what resources are available to you. As you plan, you will collaborate with partners to determine their role in strategy implementation. Together you will establish key indicators so you can measure future progress, and you will decide on your implementation schedule. Once you have your plan, you are ready to act by implementing and monitoring it. Need Guidance Creating a Plan?